At the time when cinema people are busy having selfie with political ‘celebrities’, the candidness and clarity shown by Kannada film star Prakash Raj is remarkable. He need to be complimented for his forthright views even when he spoke at a big conference convened by a ‘National’ media house in Hyderabad, most of the ‘national’ ‘voices’ remained silent and show the power of those who want to keep the media not just limping but completely crawling. The Hindutva’s goons washed the venue where he spoke a few days earlier with Gaumutra. They continue to target him. Media will deliberately keep the issue boiling. What did he say. He opposed the ban on a movie and he suggested that Hinduism is not what Modi and Amit Shah are practicing. I think, it is essential for the Hindus to take control of their religion and now to allow it become an ‘organised’ one where some contractors control it. Even when we disagree because people like me feel what Modi and company are doing reflect the deeply brahmanical values. But we have no problem if some people claim that Hinduism is not that. It is important for those who have faith whether Hinduism, Islam or Christianity or any other religion to take control of their own self and thwart attempt of those who want to flourish on values of hatred and misconceptions. In fact, Rahul Gandhi can take a cue from Prakash Raj in this regard but perhaps the khakis inside the congress continue to push him to show his ‘secret-sacred thread’ showing more religiosity. I think there is a risk. You might have this approach of being too much religious and trying to tell that you are more Hindu than the Sanghis or Hindutva people. I think if some people think that they represent liberal Hindu then they have to behave more secular and progressive and should not behave more regressive than the Sanghis. Unfortunately, the so-called liberals some time behave in such a way that the Sanghis look more progressive compare to them. Rahul Gandhi could speak of a modern India where youths are dominating the political discourse and aspiring to achieve. That modern India can be only possible if religion remain just a personal thing and all public display of religions and its congregations, ceremonies must be avoided if not banned. Rahul Gandhi should not have confined Hinduism to going to temple and showing his ‘secret thread’ because thread divide people. I would have gone a bit ahead suggesting that Rahul Gandhi should have felt proud of a multicultural family which has mixture of diverse ethnicities as well as nationalities. Today’s youth should break these caste and nationality barriers. Unless youths are allowed to right to choice whether in marriage, eating, living or selection of job, India will not progress. A theocratic India will ultimately damage it and will be detrimental. The best lessons could be our neighbors where theocracy destroyed democracy and military dictates democracies. Will it be a good if same things happen. The job of the armed forces is to protect our border and not to dictate terms and conditions to political leadership. India can only progress and become a powerhouse of ideas if ideas are allowed to flourish and its diversity is protected and encouraged. The Sangh version of India is a homogeneous India. Hindi, Hindu and Hindusthan which will only create unrest in the country. You can not impose particular brand of food, language and lifestyle on people in a country of so many ethnicities, languages and regions. This will be unacceptable. Secondly, most of the people and diverse religious identities here are not really immigrants but children of the soil and have been living here for centuries much before the British stitched us into a political India that we are today. We need to clearly define what does secularism mean and not to allow it to be distorted by the Hindutva loudmouths who are trying to make it sound like an abuse. Secularism has nothing to do with being atheist or theist. It is basically for the state to remain equal to all the religion and belief system including non believers. The French republic maintained secularism means that state shall have no religion while our secularism was that state will have equal respect for all the religions. Why is this abhorrence for other religions. Is it because the Hindutva theoreticians somewhere feel conscious that the brahmanical system was most degrading to human being and divided people on so many lines. Rather than feeling apologetic and attempting to better the value system, the modern day Hindu Nationalists are simply targeting and attacking those who disagree with them. As I said there are two main kind of differences. One the likes of Prakash Raj and say, Rahul Gandhi, and other mainstream politicians who claim they are better Hindus without doing any thing or challenging the wrongs of it. There are others who have inherited the greater legacy of Buddha, Ambedkar, Phule, Periyar and so many other revolutionaries who just decided that brahmanical ways cant be their ways and hence they created their own path whether it was Satya Shodkhak or Self Respect or Prabuddha Bharat, every one of them had to a conclusion that the brahmanical religion of the varna system is a disease and cannot be cured hence they chose their own path of enlightenment. The real liberation is in the path of those who wished us to be freed from god and godmen, who wanted us to discuss, debate and think beyond horizon. 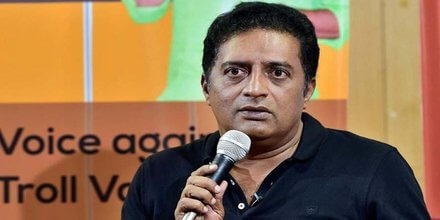 So while we welcome the voices of Prakash Raj that in these times too there are very few like him, who have capacity to take the communal minds head on, we would say it clearly and candidly that India’s real freedom will not be achieved through religions but on the burning ashes of religions as Rahul Sankrityayan said long back. Moreover, even if people want religion, let them have their ones, very privately and let us now allow religion to be organised ones creating hatred, anarchy and finally law and order problems. Let individual have his personal faith but let it not be allowed in public sphere. Let it not be allowed to dictate us. India can not afford to have a theocratic democracy as it is bound to destroy us. It is our duty to speak up and be counted among those who continuously campaigned for a modern, secular, democratic, socialist republic as envisaged by our constitutional forefathers.